TUESDAY MARCH 6 (West Harrison, NY) – SATURDAY MARCH 24 Playing for the first time in 12 days the Westchester Community College Baseball team returned to the diamond on Saturday against UConn-Avery Point. Avery Point defeated WCC during the 2017 Eastern District Championship to advance to the NJCAA World Series. The visiting Huskies recorded two victories, winning 8-5 and 5-2. Both games were similar with Westchester and UCAP playing even baseball, with the exception of one inning. A 2 out rally in the top of the 4th snapped a 1-1 tie and broke the game wide open. Paul Franzese (Somers, NY/Somers HS) had a huge game at the plate, as he went 3 for 4, including two tape-measure doubles that would have been home runs in any other facility. The sophomore had two RBI’s and scored a run. Bobby Wootten (Ardsley, NY/Ardsley HS) also had two hits as the Vikings had 11 hits against an outstanding UCAP pitching staff. Sophomore Nick Cona (Cortlandt Manor, NY/Panas) pitched five strong innings, striking out four. The second game saw the Vikings take a 2-1 lead entering the fifth inning, but a three-run rally by the visitors put them in the lead for good. 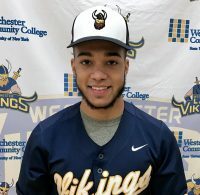 SUNDAY MARCH 25 Just when it seemed to be a lost weekend for the Westchester Community College Baseball team, Jose Delacruz (New York, NY/George Washington HS). A five-run sixth inning, capped by a two-run Delacruz double gave the Vikings the cushion they needed as they rallied to win the nightcap from Adirondack Community College, 7-5 at Silver Lake Park in West Harrison, New York. With the win, the Vikings improve to 6-5 after dropping the opener 7-6. Game two started well for the Vikings as WCC scored right away. Scottie Giordano (Croton, NY/Croton-Harmon HS) led off the bottom of the first inning with a triple. Paul Franzese’s (Somers, NY/Somers HS) double drove him in. However, Adirondack battled back throughout the middle innings, tying the game with a third inning home run, taking a 3-1 lead in the fourth inning, and led by as many as two runs, 3-2 heading into the bottom of the sixth inning. That is when the Viking bats came alive. Christian Lovecchio (North White Plains, NY/Valhalla HS) led off with a walk, and advanced to third on a Giordano double. A Franzese hit allowed both base runners to score, and tie the game. Bobby Wootten (Ardsley, NY/Ardsley HS) then singled to put two runners on base, allowing Delacruz’s double to put the Vikings up 6-4. An Adirondack error brought Delacruz home for a 7-4 lead heading into the top of the seventh inning. Max Marienberg walked a batter to open the seventh inning, but WCC was put in a position to end things after a beautiful 4-6-3 double play to put Westchester one out away from victory. The victory would not come easy as an error, followed by two consecutive Adirondack hits brought home an unearned run to make it 7-5. Michael Matalavage (Croton, NY/Croton-Harmon HS) replaced Marienberg, and induced a pop out to end the game. Giordano had two hits while Franzese added 3. Giordano also scored twice for WCC. CJ Sager (Mahopac, NY/Mahopac HS) also had two hits. Marienberg picked up the win to improve to 2-0 for the season, and Matalavage got a save. The opener saw Westchester battle from behind from the beginning as Adirondack had a 4-0 lead after two innings. WCC battled back, as a Sean Vanegas (Bronx, NY/Mount St. Michael) sacrifice fly and Giordano RBI single made it 4-2, and an Adirondack error allowed Giordano to score to make it 4-3. Adirondack extended the lead to 6-3 heading into the bottom of the fourth before Westchester battled back once again. Wootten made it 6-4 with an RBI single in the fourth inning, and then came through again two innings later with an RBI single to make it 6-5. Steve Messerschmitt (Carmel, NY/Carmel HS) completed the comeback with an RBI single to score Wootten and tie things at six. However, a two-out single in the top of the seventh inning put Adirondack up 7-6, and the score would hold up. Wootten had two hits and two RBI’s, and Messerschmitt had two hits as well. Both WCC runs were scored during the second inning. Scottie Giordano(Croton, NY/Croton HS) led off with a triple, and was brought home by a James Houlahan (Yorktown, NY/Lakeland HS) double. A Franzese single brought home Houlahan, but the Vikings were unable to score from that point. Nicholas Antenucci (Yonkers, NY/Stepinac) was terrific on the mound, striking out five. Westchester Community College Director of Athletics, Mike Belfiore, has announced the addition of Men’s and Women’s Track & Field as the program’s latest offerings to student-athletes. Once both programs achieve varsity status, the number of varsity programs offered by Westchester CC will increase to 15. Belfiore also announced the hiring of Taneisha Cantave as Head Coach for both programs. “We are very excited to add Track & Field to our athletic program at Westchester Community College. Between the addition of Men’s and Women’s Cross Country in 2016, bringing back Men’s and Women’s Basketball this year, and now the addition of Track & Field, we have nearly doubled our sport sponsorship during span of a year and a half. This is only possible because of the continued support of our administration, and the enthusiasm displayed by our student body. When announced a general interest meeting for Track & Field, the response was overwhelming. It made the decision to sponsor Track & Field easy to make. Between the enthusiasm by our student body, and having a fantastic coach like Taneisha Cantave lead our program, I think we have a bright future ahead of us,” said Belfiore. Westchester becomes the seventh NJCAA Region XV institution to sponsor Track & Field at the NJCAA level. Headlining the field is Kingsborough Community College, who captured the NJCAA National Championship for both Men’s and Women’s Track & Field in 2017. Cantave is no stranger to Westchester Community College, as she is presently the Head Women’s Volleyball Coach at WCC. During her first season in Valhalla, Cantave led the Vikings to the Mid-Hudson Conference playoffs. She has a tremendous background in Track & Field, starring at Suffern High School before competing in both Volleyball and Track & Field at Sacred Heart University. Cantave is a member of the Track and Field Rockland County Hall of fame. Belfiore said having a coach already on staff with Cantave’s background in Track & Field would help the program build immediately. “I think anybody who was around our volleyball program this falls knows what a great job Taneisha and her staff did. She is a terrific coach, and our student-athletes gained a lot by competing for her. Having Taneisha on-campus even more frequently as a two-sport Head Coach is to the benefit of our department. I am very optimistic that both programs overseen by Coach Cantave will be successful.” Belfiore said.